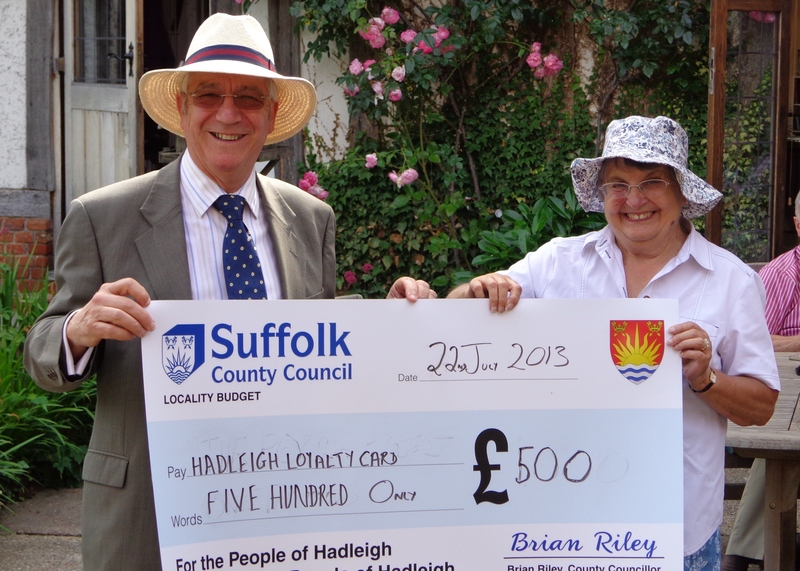 Yesterday I had the pleasant task of allocating £500 from the Community Locality Budget provided by Suffolk County Council for whom I represent Hadleigh. The focus was on the Hadleigh’s Loyalty Card shopping scheme set up by the town’s Chamber of Commerce which has been such a success that it’s been difficult keeping up with demand for the cards. Two print runs have been exhausted and cards were in short supply. So it was a timely intervention to finance the printing of 25,000 more cards with an allocation of £500 from the Community Locality Budget. Jane Haylock of Hadleigh Chamber of Commerce received the cheque at the Chamber’s summer party at Priory Hall in Hadleigh. Hadleigh Chamber of Commerce President, Tony Addison, welcomed the cheque and said how pleased he was to see such a commitment to Hadleigh’s future and the recognition that market towns are worth supporting. The Loyalty Card, which was Jane’s project, encourages people to shop locally. Shoppers collect stars on the card each time they spend money in participating shops, pubs and restaurants. When all 10 stars are collected the cards are handed in to take part in a monthly prize draw. “We now have 1,700 handed in each month which represents 17,000 sales in Hadleigh shops,” said Jane. About 75 percent of the cards handed in come from Hadleigh residents with the rest from neighbouring villages and some from people who have stayed in the town as tourists.